Fires are burning on both the northern and southern edges of San Luis Obispo County, as well as in Santa Margarita. Additionally, a fire is burning near Lake Cachuma in Santa Barbara County, and a blaze burned briefly in Morro Bay over the weekend. The fast-moving Alamo Fire along the Santa Barbara-San Luis Obispo County line has burned 28,926 acres and is 15 percent contained, as of Monday morning, according to Cal Fire. 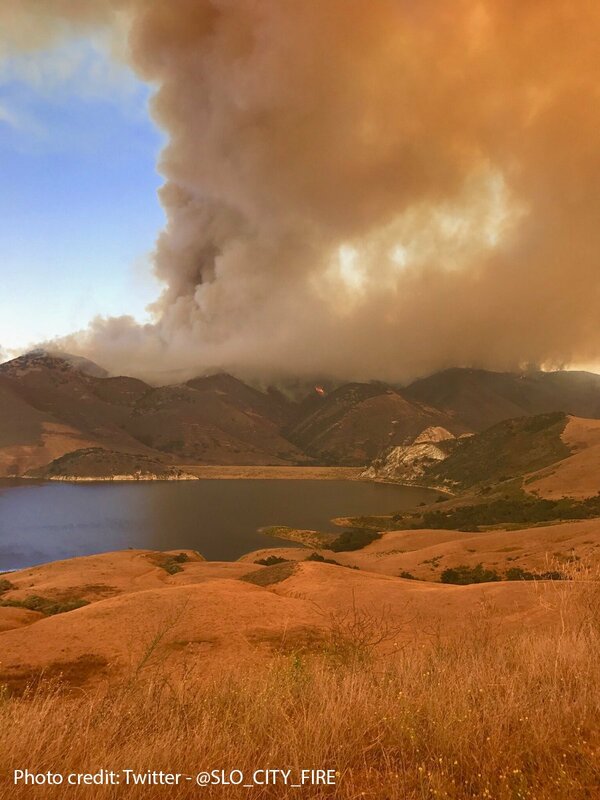 The fire ignited Thursday afternoon off Highway 166 near the Twitchell Reservoir in San Luis Obispo County. It has burned on both sides of the Santa Barbara and San Luis Obispo county line, with movement based on wind patterns. The Alamo Fire has destroyed one home and is threatening 133 structures. Evacuations orders were issued for Tepusquet Road south of Blazing Saddle to Santa Maria Mesa Road, White Rock Lane and Colson Canyon. Around SLO County’s northern boundary, the Parkfield Fire has burned 1,816 acres and is 80 percent contained. 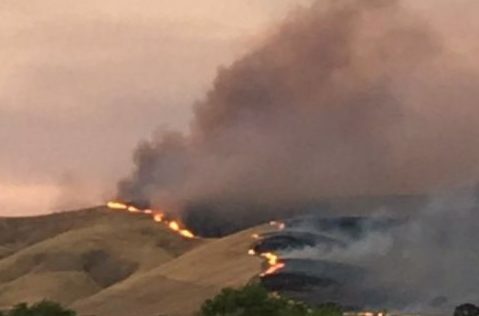 The Parkfield Fire started around 6:30 p.m. Saturday near the San Luis Obispo-Monterey County line. The blaze has been burning in an area between San Miguel and Parkfield. On Saturday evening, a firefighter suffered second degree burns while battle the blaze and was evacuated by air. The Parkfield Fire has also destroyed at least one structure. At about 7:15 p.m. Sunday, the Stone Fire sparked along Huer Huero Road east of Santa Margarita. The Stone Fire has burned 340 acres and is 40 percent contained, as of Monday morning. The Stone Fire has reportedly burned four structures. In Santa Barbara County, the Whittier Fire is burning near Lake Cachuma south of Highway 154. As of Sunday evening, the Whittier Fire had burned 7,800 acres and was just 5 percent contained. Lastly, Morro Bay fire officials say a vegetation fire caused by illegal use of sky lanterns broke out Saturday night on a steep hillside adjacent to Zanzibar Street. Firefighters responded quickly and contained the blaze to one acre. Dear Moonbeam, we finally made the front lines of the national news, yahoo and google!!!! Thank You for being the commander and chump of the state hated by the other 49. There are thousands of responses to the numerous headliners about Ca burning and not a one with anything good to say about Ca. Good to know after years of your stupidity millions are glad to see ” us “burn baby, burn”. and say things like “good the fires aren’t in America. Oh… and about the documentaries on engineering disasters from decades ago that told us Ca’s damns are failing,aged and crumbling, glad to see you addressed that infrastructure problem. Maybe we can load up the BS train to nowhere’s cars with water and send them where its needed next drought. Lol WHAAAA WHAAA. Good lord could you whine any more. If you have the answers then run. Who knows maybe I’ll agree with you on enough issues to support but early polls suggest not. How soon will we hear that they’re all the fault of “man-made” climate change?